More and more people are living to 100 in the developed nations of the world. In the U.S., only .0015% of the population reached the age of 100 in 1950. In 2010, that number increased dramatically to .0173%. 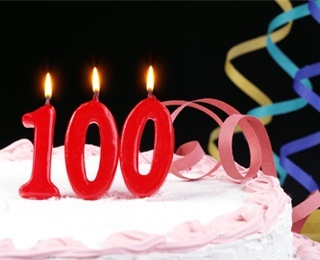 You are more likely to live to 100 now than at any time in history. However, reaching the century mark is still unlikely for a large part of the population. Does your waist measure 37 inches or more if you’re a woman, 43 inches or more if you’re a man? Give yourself 2 points if you answered NO. Research indicates that men with waistlines of 43 inches or more had a 50% higher risk of death than those with waists less than 35 inches. Women with waists of 37 inches or more had an 80% higher risk of death than those with waists of 27 inches or less. For every 2 inches of increased waist circumference, the risk of death increased 7% in men and 9% in women. Do you limit your caloric intake to below 2,000 calories a day? Give yourself 2 points if you answered YES. Researchers in St. Louis reported that the hearts of men and women who limited their daily calories to 1,400 to 2,000 (about 25% fewer calories than those who follow a typical 2,000- to 3,000-calorie Western diet) functioned like those of people 15 years younger. Do you have more than 2 chronic health conditions, such as arthritis, diabetes, kidney disease, hepatitis C, high blood pressure, or heart disease? Give yourself 4 points if you answered NO. Give yourself 2 points if you only have 2 conditions. The more chronic medical conditions people have at retirement age, the shorter their life expectancy may be, a new study shows. Almost 4 out of 5 older Americans have multiple health issues. “The medical advances that have allowed sick people to live longer may not be able to keep up with the growing burden of chronic disease,” said Eva DuGoff, lead author of the Johns Hopkins Bloomberg School of Public Health study. Do you exercise a minimum of 150 minutes or more a week at a moderate level? Give yourself 2 points if you exercise a minimum of 150 minutes or more a week at a moderate level. Give yourself 4 points if you exercise moderately for 450 minutes per week. One study shows that those who exercised a little, not meeting the recommendations but doing something, lowered their risk of premature death by 20%. Those who met the guidelines precisely had a 31% less risk of dying, compared with those who never exercised. However, those who tripled the recommended level of exercise, working out moderately, mostly by walking, for 450 minutes per week, were 39% less likely to die prematurely than people who never exercised. Is your blood sugar higher than normal? Higher-than-normal blood glucose levels reduced life span by 0.5 years in men and 0.3 years in women. Do you deal with stress well or have little stress in your life? Numerous studies have pointed out the negative effects of stress. One study found that people who sometimes stayed awake at night worrying or had trouble concentrating on tasks were about 20% more likely to die over a 10-year period compared to people who reported no such symptoms. Do you or have you had cancer, other than minor skin cancer? Give yourself 4 points if you have never had cancer. Give yourself 2 points if you had Stage 1 cancer and did not receive radiation therapy. Recovered cancer patients are twice as likely to develop the exact same cancer again. The risk of developing other types of cancer than the one previously diagnosed is only slightly higher for cancer survivors than for people who’ve never had cancer. The risk of developing cancer from radiation therapy depends on multiple factors; however, it does exist. Do you have lots of close friends and/or family and see them often? Give yourself 4 points if you answered YES. Give yourself 2 points if much of your interaction is online. Face-to-face time spent socializing with your friends, family members and even strangers might increase your life span. The benefits are less with online time. Researchers at the Mayo Clinic found that people originally classified as "optimistic" on a standard personality test turned out to be 20% less likely than their “pessimistic” counterparts to suffer an early death. Give yourself 4 points if you don’t smoke and have never smoked. Give yourself 1 point if you smoked in the past. Heavy smoking deducts 2.5 years from the lifespans of men and 1.8 years from those of women. Current smokers were 3 times more likely to die than those who’d never smoked. People who have a positive outlook on life and a sense of purpose and community are healthier than those who don’t. Do you ever drink more than 2 alcoholic beverages a day? Give yourself 4 points if you don’t drink at all. Give yourself 2 points if you drink less than 2 alcoholic beverages a day. People who abuse alcohol or drugs knock off between 9 and 24 years from their lives. Previous studies that indicated moderate alcohol intake extended lifespan did not control for socioeconomic and other benefits. Have you completed a bachelor’s degree or higher? Give yourself 2 points if you completed your freshman year of college. Give yourself 4 points if you received a bachelor’s degree or higher. Centers for Disease Control statistics indicate people with a bachelor's degree or higher, increased life expectancy by 1.9 years for men and 2.8 years for women. Even college freshman increase their life expectancy by 18 months. Do you drink colas (even diet colas) 3 or more times a week? Scientists found that drinking 1 or more colas every day doubles your risk of metabolic syndrome, which includes high blood pressure, elevated insulin levels, and excess fat around the waist. Metabolic syndrome increases your risk of heart disease and diabetes. Flossing daily could add more than a year to your life by preventing gum inflammation. Not only is gum inflammation a sign of chronic bacterial infection, your body allocates resources from your immune system to fight the bacteria, which may, over time, cause arteries to narrow. Loud snorers have a 40% greater risk of high blood pressure, 34% greater risk of a heart attack, and 67% greater risk of a stroke. Are you your mother’s first-born child and was she young when she had you? After analyzing historical data on 198 centenarians, scientists at the University of Chicago say first-born children of young mothers were 1.7 times more likely to live to 100. Do you or have you ever had psoriasis? Give yourself 4 points if you’ve never had psoriasis. Give yourself 2 points if you’ve had psoriasis in the past but don’t have it now. People with severe psoriasis have shortened life spans, attributable to an increased risk of cardiovascular disease. Are you a regular church-goer who is engaged with your church? Advantages in longevity were reported for religious people in the U.S..
Do you eat processed meats, such as hot dogs, chicken nuggets, sausage, or bologna, on a regular basis? Give yourself 4 points if you don’t eat red or processed meats. Give yourself 2 points if you don’t eat processed meats. Give yourself 6 points if you’re a vegetarian. Eating more than 18 ounces of red meat per week increases your risk of colorectal cancer. Colorectal cancer risk also rises by 42% with every 3½-ounce serving of processed meat, such as hot dogs, bacon, and deli meats, eaten per day. A study of Seventh Day Adventists, who are vegetarians, showed a 12% lower risk of dying over the 6 years tracked. Give yourself 4 points if you answered YES. Give yourself 1 point if you’re only a little overweight. Calculate your body mass index or BMI here. Obesity (measured by BMI) reduces life span by 1.3 years. If your weight is at least 20% higher than it should be or your BMI is 30 or higher, you’re obese. If your BMI is 25 to 29.9, you are overweight. Give yourself 4 points if you answered YES. The researchers found that high blood pressure at the age of 50 reduced life expectancy by about 5 years. The current overall life expectancy for U.S. men is 76.4 years and for U.S. women is 81.2 years. A statistical study shows the rural-urban life expectancy gap widening from 0.4 years in 1969 to 1971 to 2.0 years in 2005 to 2009. Would you describe your socioeconomic status as poor or working class? As socioeconomic status decreases, so does life expectancy, most likely because it affects a person’s ability to access adequate medical care and their participation in healthier lifestyle habits. Give yourself 2 points if you answered YES. Give yourself 1 point if you’re married, but you have your ups and downs. Married people have lower mortality rates than those who were never married, are divorced or are widowed. Various studies link marriage or committed relationships with improved cardiac health, less isolation and loneliness, and positive lifestyle choices. If your total was 48 or higher, barring accident, you have a great chance of living to 100. If it was lower, consider making some lifestyle choices that will improve your odds. One of the many goals at Kendal at Oberlin is for residents to live long, healthy lives with a high quality of life. Our values include improving “the quality of life and vitality of those we serve”. We do this by providing the physical means to improve via our fitness center and classes, as well as through emotional support provided by our residents and staff. We treat each person as a valued individual in a caring atmosphere. As a continuing care retirement community, we provide coordinated care for our residents throughout the stages of life. To sample life at Kendal at Oberlin, we offer a Try It, You’ll Like It program. Sample living at Kendal at Oberlin by spending a night or two with us. For more information, call 800-548-9469.